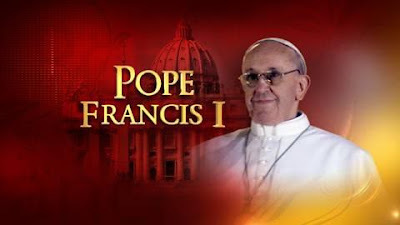 WE LOVE AND EMBRACE YOU HOLY FATHER!!! MAY MOTHER MARY PROTECT YOU ALWAYS!!! VATICAN CITY (Reuters) - Pope Francis, the former Cardinal Jorge Bergoglio of Argentina, delivered his first blessing and message to Rome and the world about an hour after his election as successor of Pope Benedict. Here is a transcript of his first words as pope as translated by Reuters from the Italian. "Brothers and sisters, good evening." "You know that the duty of the conclave was to give a bishop to Rome. It seems that my brother cardinals went almost to the end of the world to get him. But here we are. "I thank you for this welcome by the diocesan community of Rome to its bishop. Thank you. "First of all, I would like to say a prayer for our bishop emeritus, Benedict XVI. Let us all pray together for him, let us all pray together for him so that the Lord may bless him and that the Madonna may protect him." (The new pope then prayed the "Lord's Prayer", the "Hail Mary" and the "Glory Be" with the crowd in Italian). "And now, let us start this journey, bishop and people, bishop and people, this journey of the Church of Rome, which leads all the Churches in charity, a journey of fraternity, of love, of trust among us. "Let us always pray for us, one for the other, let us pray for the whole world, so that there may be a great fraternity. I hope that this journey of the Church that we begin today and which my cardinal vicar, who is here with me, will help me with, may be fruitful for the evangelization of this beautiful city. "Now, I would like to give you a blessing, but first I want to ask you for a favor. Before the bishop blesses the people, I ask that you pray to the Lord so that he blesses me. This is the prayer of the people who are asking for the blessing of their bishop. "In silence, let us say this prayer of you for me." (After a few seconds of silent prayer, he then delivered his blessing). "Now, I will give you and the whole world a blessing, to all men and women of good will. Tomorrow I want to go to pray to the Madonna so that she protects all of Rome. Good night and have a good rest." 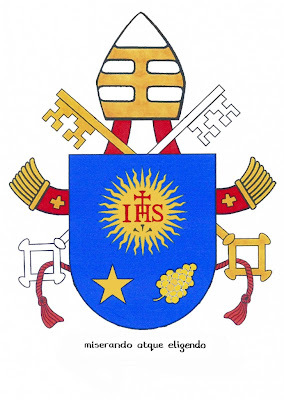 The coat of arms of Pope Francis borrows much from his former episcopal emblem. On the blue shield is the symbol of the Society of Jesus. Below it is a five-pointed star and the buds of a spikenard flower, which represent respectively Mary and St. Joseph . The papal motto is the Latin phrase "Miserando atque eligendo," which means "because he saw him through the eyes of mercy and chose him" or more simply, "having mercy, he called him." The phrase comes from a homily by St. Bede.